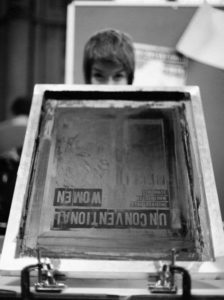 Sally Gilford is an artist and print-maker, working on a number of socially-inclusive projects across the north. 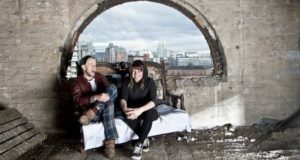 She is one of the Openmaker finalists, partnering with Salix Homes Developments and Islington Mill Arts Club to fit out three experimental microhomes. Co-founding print specialist One69A at Salford’s Islington Mill, with Mark Jermyn, Sally’s responsible for looking after the education side of the business. She works with groups from primary schools to secondary and university, alongside a variety of other institutions and groups including 42nd Street, an organisation working with teens with mental health issues, and on Kew Gardens’ ‘Go Wild’ project in Liverpool. One69A also works on a commission basis with galleries and museums including the Whitworth, Leeds City Art Gallery, Museum of Liverpool and Yorkshire Sculpture Park. Sally also develops her own textile and printing practice, producing original textiles and patterns. She is currently working with the Welcome Trust with the University of Manchester and often collaborates with other artists. Studying interactive art at university has made her a ‘doer’, she says. ‘My degree was an “ideas-based” course, giving me practical skills to problem solve, which was an important aspect of my learning. Sally’s work often involves groups that have a social impact, and she’s looking forward to taking part in a conscious design of people’s environment. Microhome is partnering with Salix Homes, constructing small spaces for live/work space, for the homeless, or in places where people are being pushed out by development. It considers how conscious design impacts on peoples’ lifestyle and health, and three micro-homes are planned for the National Housing Federation showcase. The biggest challenge, says Sally, is to ‘fend off imposter syndrome! I also want to make sure I’m always being creative and encouraging others to be creative, and to see the positive impact and affect on people’s happiness and wellbeing. I need to achieve a better work/life balance, with more sleep, and would like to develop my own textiles and products, and be recognised and successful at this. I need to devote more time to it… I think OpenMaker will help me do that. ‘I’m hoping it will help develop the socially-engaged practice. My plan is to work with manufacturers, so that companies can produce my products, like a digital manufacturer for the fabrics/textiles. It will bring the different elements together, and into my ‘practice’, giving me more knowledge of the sphere of manufacturing and strengthening collaboration with other artists.